YouTube has an annoying bug – videos starts re-buffering when we switch to full screen mode from normal mode. On a high speed broadband connection the re-buffering issue may not be annoying much but on a slow broadband connection it annoys hell out of us. When users reported this problem to YouTube, the engineers at YouTube dubbed it as a feature rather than bug!. That is sick and this behaviour shows that they started ignoring the users and their problem. Anyways we got solutions to get around this annoying issue. The root cause of the bug is YouTube’s resolution switching mechanism.When the video is loaded in normal model it is buffered and played at 360p, but when the full screen mode is activated YouTube player switches to 480p and starts re-buffering the video. Fixing this issue on Google Chrome is very simple. All we need to do is to install this Greasemonkey script and it fixes everything for you. Done. Firefox will handle the full screen switching smoothly. Hufff!! Internet Explorer users are poor users not because they are dumb but because they are using stone age browser. No offense, IE is a pathetic browser and there is no support for Greasemonkey scripts. Anyway lets look at the solution for fixing YouTube issue on IE. 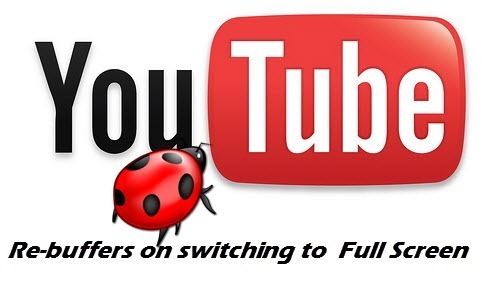 To fix the YouTube bug you need to follow the official solution provided by Google and it’s not a friendly one. 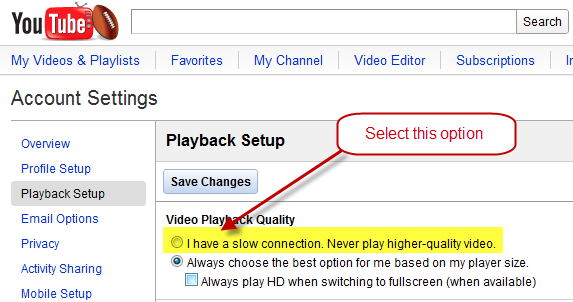 Step 1: Login to your YouTube account and select the option “I have a slow connection. Never play higher-quality video“. Step 2 – Repeat Always: Make sure that you are always logged into your YouTube account as YouTube need to know your settings before switching the resolution. (Now you know why I called IE as a poor browser).